Another post! In so many days no less! Well I’ve got an article from 2008 on Alexie’s show NEW AMSTERDAM where she starred alongside Nikolaj Coster-Waldau. Alexie played the part of Dr. Sara Dillane, a woman who might have been “the one” John Amsterdam was looking for to make him mortal again. The show only ran eight episodes and was summarily cancelled by FOX Television in their quest to once again blow it on keep a truly quality show on it’s network. It was largely left in a cliffhanger. I’d love to know if it would be possible to bring it back considering Nikolaj’s success on Game of Thrones as Jaime Lannister, the Kingslayer?I would love to be optimistic, but I’m very much the doubting Thomas and will likely remain severely disappointed. Alexie sneaked in a quickie on me. I didn’t see this till now, however, Alexie guested on an episode of the TNT series LEGENDS starring the former Game of Thrones star Sean Bean. 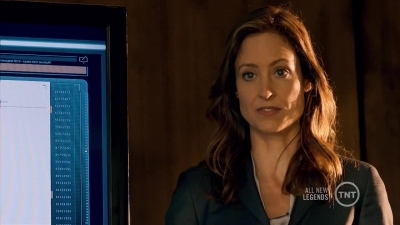 Alexie’s role was a small one playing Special Agent Serena Milloy, Diplomatic Security, U. S. State Department. Whoa, sounds really governmental-ish. She looked lovely as usual. My gosh she’s tall and in heels she’s positively Amazonian.